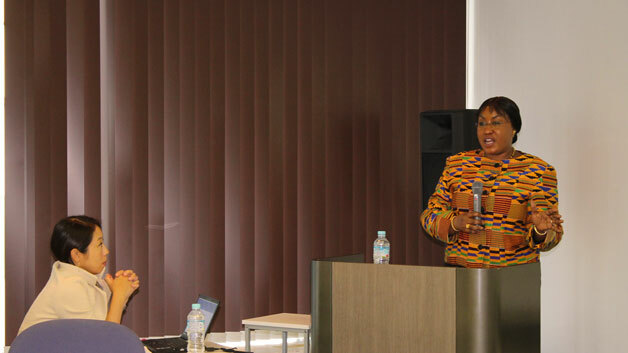 On 7 December, UNU-IAS held a seminar on Education and Skills for Employability in Africa, welcoming Oley Lucretia Clara Dibba-Wadda, Director of Human Capital in the Youth and Skills Development Department of the African Development Bank (AfDB), as guest speaker. Dibba-Wadda emphasized the critical lack of opportunity that many African youth face due to high unemployment rates across the continent. Drawing attention to the need for inclusive growth led by the education sector, she focused on the importance of empowering young entrepreneurs to create new jobs for the unemployed, while simultaneously working to improve the incomes of those already employed. Although Dibba-Wadda mentioned that there is no one-size-fits-all solution to solving the issue of youth unemployment, she clearly conveyed the message that human development is fundamental to progress, and that further support is necessary to harness the huge potential the next generation holds.